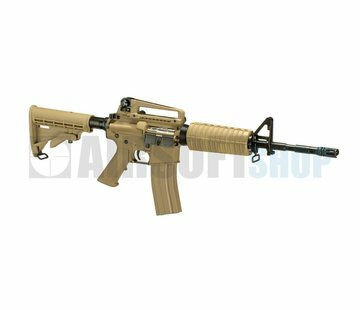 G&G TR16 MBR 308SR (Black). 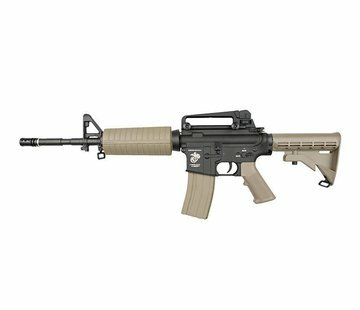 The full metal upper and lower receivers and functioning bolt catch add a level of realism to this G&G rifle. Ambidextrous magazine release and fire selector ensure any player, despite being left or right handed, can operate this rifle with no limitations. The multi-position adjustable Crane stock allows for easy alteration of overall length for players of all sizes to operate this rifle comfortably, and makes it quick and easy to adapt from CQB to long range engagements. The flip-up High Visibility front and rear iron sights are perfect for zeroing in your targets on the spot, or can be flipped down to make room for your choice of optic accessory. The full metal G2 Gearbox features an upgraded torque motor for peak performance, and 8mm bearing & bushing combination to ensure smooth and reliable gear change and requires less maintenance due to heavily decreased levels of wear and tear. The gearbox also comes outfitted with a programmable MOSFET unit to program the trigger to 3 or 5 round burst, and features a Low Battery warning to let you know when it’s time to switch out batteries so you’re not stuck on the battlefield with a dead rifle. This rifle is also outfitted with low resistance wiring to protect trigger contacts and reduce shortages power loss. The integrated Quick Spring Change System allows the player to quickly and easily modify or adjust the power level and rate of fire by upgrading the spring. By combining a rugged metal build with the power and accuracy needed to out-gun the competition, G&G has created an AEG that will surely resonate with players of all skill levels and play styles.